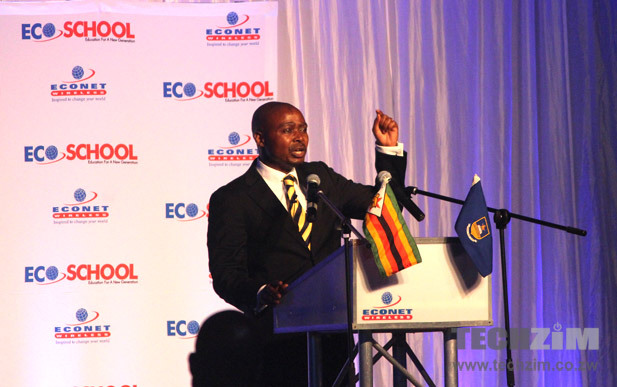 Econet Services CEO, Darlington Mandivenga, speaking at the EcoSchool launch today. The last time Econet announced the number of it’s EcoCash subscribers was back at the beginning of October 2013 when the services’ subscribers reached 3 million. Today, at the launch of a new education platform EcoSchool, Econet Service CEO, Darlington Mandivenga, revealed that EcoCash subscribers have increased to 3.5 million since then. To put that number in perspective, those registered EcoCash subscribers of the platform are more than the total active mobile subscribers on the second largest mobile network in the country, Telecel (who have about 2.5 million). Mobile money really has grown phenomenally Zimbabwe! No numbers were given today on the transaction volumes, or general activity by those 3.5 million subscribers. Understandably so, coz it’s not an EcoCash event. So more on that if we do get it.